« Etsy Kitchen Histories: A History of Halloween! 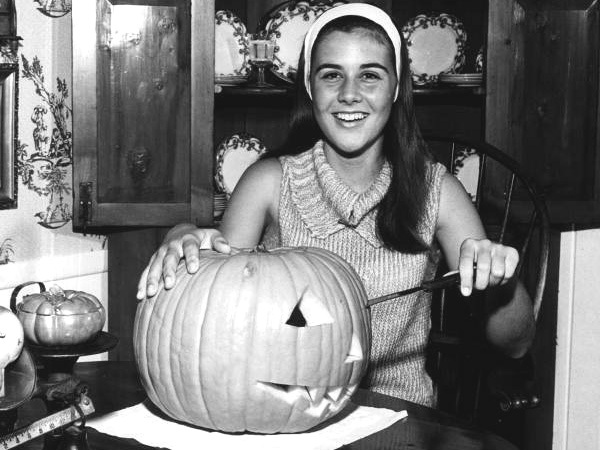 Pine Crest School student carving a Halloween pumpkin: Fort Lauderdale, Florida, 1966 or 67. Over on Etsy, I recently investigated the early origins of Halloween traditions, including Trick or Treating. But my research turned up a 20th century twist that I had never considered: the old “razor blade in the apple,” and the fear associated with Halloween candy. I was a trick-or-treat migrant. My mom would import me from my rural home to the neighborhood where she grew up in, an urban suburb with houses closely packed on postage stamp-sized lawns. These city blocks, not the country ones that stretched for miles, were prime candy-collecting territory…I’ll never forget the feeling of adventure, pressing onward into the night, my pillowcase getting heavier and heavier with my candy treasure. The neighborhood Mom took me to was old-school, meaning in between the houses that passed out Tootsie Rolls and pennies, there were places where elderly couples passed out King Size Snickers bars–king sized! And I’ll never forget the night when a tiny, teetering old lady came to the door with a sheet of freshly baked cookies, still warm from the oven. I took the cookie to my Mom, terrified. Every year, teachers and television had beaten into my brain to only accept store-bought, wrapped candy. Even then, the treats had to be inspected for tampering. My mom laughed at my nervousness–”If you don’t want it, I’ll eat it!” And she did. And she said it was delicious. I’ve never forgotten that little old lady. To this day, I wish I had eaten that cookie. That cookie was from an earlier era: through the 1950s, a trick-or-treator could receive a bevy of homemade treats, and in many cases, could expect to be invited in (to stranger’s homes!!) for punch, snacks, and games. But that all changed in 1964 when a woman in New York got fed up with kids she thought were “too old” for trick-or-treating and began passing out bags of “dog biscuits, poisonous ant buttons, and steel wool” as a trick (source). No one was injured in the incident, but it gave birth to the legend of dangerous Halloween candy. The news media ran with the story, warning parents to inspect candy for tampering, and throw away any homemade treats like apples–lest they contain a razor blade. The “razor blade” motif began emerging in the late 1960s, when the Times reported on more than 20 cases of apple tampering in New Jersey. The razor blades were found by children eagerly chomping into their apples, who then revealed their discoveries to their parents. Except, stop to ask yourself what child is wildly biting into apples on Halloween, when there is a pile of candy as an alternative? It’s ludicrous–and all the incidents were found to be hoaxes (source). But the nail in the coffin came in 1982, during the Tylenol tampering scandal. Consumers began to fear commercial goods and homemade treats alike, and the heyday of trick-or-treating began to come to an end. An early 20th century Halloween prank. It’s interesting how this scenario turns the trick-or-treating tradition on its head. The practice evolved, sort of tongue in cheek, as a bribe to prevent young pranksters from wreaking a little holiday havoc on your house (common prank: remove gate from hinges and leave in street). But in the modern situation, the person who would have been the victim is now pranking the pranksters. And it resulted in a culture of fear. More and more, general warnings about dangerous candy have resulted in parents and community organizations throwing Halloween parties as opposed to trick or treating. These parties are a throwback to the games and treats of early 20th century Halloween celebrations and they’ve also revived many of the old Harvest celebrations like bobbing for apples. I enjoy a good Halloween party–but I still hope I can give my children the thrill of hunting through the darkened streets for the King-Sized Snickers bars. What do you think: will your family be trick or treating this year, or throwing a party instead? I grew up in that era and remember the caution about “razor blades in apples.” Definitely changed trick-or-treating forever. I remember Halloween 1982. My sister and I couldn’t go trick-or-treating that year. But my parents bought us a pair of pet gerbils (opposite genders…) as a Halloween gift, and that was the gift that kept on giving. We got to go trick-or-treating the next year. The sad thing is that the Tylenol scandal was pretty much all one crazy person at the plant, then a copycat did the same thing. It’s too bad a few bad apples spoil the whole bunch. those gerbils are hilarious, though. My partner does a magic trick in which he puts a number of double-edged razor blades into his mouth wrapped with a piece of string and then pulls them out again all strung on the string. (It’s a variant of the “East Indian Needle Trick”). His personal twist is to start with the razor blades stuck into an apple. He calls the trick “Urban Legend”. That sounds like a great potential Halloween costumes. I was a child of the 80s, but the citizens of my small hometown in Indiana still gave out things like popcorn balls, caramel apples, ghost-shaped cookies, bags of hot salted popcorn, and other homemade treats. I even had a paper cup of hot spiced cider at one house. I remember it was well into the mid-to-late 80s before parents and teachers started hollering about razor blades and poisoned treats. The Unofficial Self-Righteous Parents Association would come banging at your door with pitchforks and torches if they caught wind of you allowing your child to accept a homemade treat from a neighbor, and so, although my parents claimed it was all a stupid myth, they went along with it to avoid being ostracized by fellow parents. It’s so interesting to read about the origin of these urban legends and how they affected a beloved American tradition. That’s depressing. Do you think we could ever revive a culture of homemade treat giving? or are the health risks/ modern day health concerns just too great? Allergies are a great concern, so nothing remotely with peanuts. All treats must be carefully labeled. Some are allergic to milk. The new tradition is to have a turquoise light on your porch, signifying non-allergenic treats available here. Some close neighborhoods still give door to door parties. The NextDoor.com network has possibilities. It’s all about knowing who and where. We had donuts, bobbing for apples, lots of fun things. A co-worker in her early 20s told me her parents never allowed her or her brother to go trick-or-treating because of their fears of being poisoned/sliced with razor blades/abducted (this would’ve been during the 1990s, I guess). I told her nearly all of those stories were just urban legend. She exclaimed, “Then why do I remember hearing about them on the news all the time??? They HAPPENED.” I wish I could recall where she said she grew up – I would like to check her state’s news archives to verify this. She was quite adamant. Oh they were absolutely in the newspapers! But it seems that in the follow up they were all proved hoaxes, but that part was never reported on. Hoaxes for the most part created by the kids. I’ve heard in some cases real poisonings by the parents of the afflicted kids (and blamed on bad Halloween candy), but I haven’t done the research to back that up yet. And there may be a proven apple/razorblade case out there–but I haven’t found it. I should add–I never doubted the authenticity of poisoned/dangerous Halloween candy until I stumbled across the scholarship that said otherwise, which was like 2 weeks ago. See my post. I lived in Staten Is., NYC, mid 1950s. It was on the news. We all watched it on the b&w set. An x-ray of an apple showing a razor blade in the apple and an advisory to parents to check the candy. We also remember, from that era, of someone throwing something on the kids (I don’t remember now — acid? hot water?). But I definitely remember seeing that apple with the razor blade in it the newscast after that Halloween. I too would like it to be verified. I clearly remember watching a newscast on television the day after Halloween in the early 1950s with an x-ray of a razor blade in an apple. That’s when everything changed. Now that could’ve been fake news, but it clearly remember how horrified I was. So the razor blade in the apple wasn’t made up later or copy cat in New Jersey. Can you please research what network showed this news story. There is was – an x-ray of a razor blade in an apple, and people were x-raying candy. Maybe the news station was saying this could be a hypothetical and ran with it, but that would’ve been beyond my years to comprehend. This is the first news story I remember. I lived in Staten Island NY at the time. When I was a kid in the 1970s, the variant of the legend I heard was that drug-addled hippies were responsible for inserting razor blades into apples. The parents back then were gullible enough to believe it. I guess the razor-blades-in-the-apples myth was spread by paranoid parents who didn’t want their kids getting drug-laced treats from hippies.